At our very first AKC show (3/26/2000), after just 3 months of training classes, Tribble earned the first leg of his Novice Standard title with a perfect First place score. During our first NADAC trial weekend (4/29 & 30/2000), Tribble qualified four times in Novice Standard with perfect scores, earned one First and two Third places, and finished his NADAC Novice title in one weekend! Onward to Open! He also qualified once in Novice Jumpers with a perfect score! Tribble and I entered our first USDAA trial June 2000 and he earned the first qualifying leg of his Novice Standard title with a fourth place in his class! Our next AKC weekend of trials (5/26-29) Tribble qualified in Novice Jumpers with three perfect First place scores! The fourth day of the show, we moved up to Open Jumpers and earned a Second place qualifying score! But we were MOST excited by the fact that Tribble, my Novice dog, and I qualified on the Grand Prix course, the regional qualifier for the USDAA National Championship that were held in San Diego in September 2000! The course was complex and required a fast, almost error-free run! Thank you, Sandy, for teaching both Tribble and me what it took to handle it! I never dreamed I would have the chance to attend and run Tribble in a National Championship! What a thrill! We had fun and even got to the second round at the Nationals, which I did NOT expect! Tribble finished his Excellent JWW title with a first place on 2/3/01. He also finished his Open Standard title with a 3rd place. Onward to Excellent Standard A and (oh boy! sarcastically) we get to compete with all those GREAT Excellent B Jumpers dogs now! (the ribbon wall isn't going to grow as fast any more)! 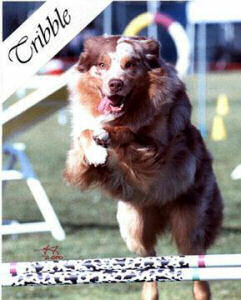 Tribble continued to compete successfully in AKC, NADAC and USDAA trials during the rest of 2001. An injury (NOT caused by agility, but a rabbit chase) in mid 2001 has forced him to take a long break. 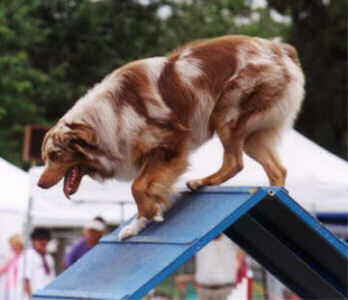 Before that happened he managed to finish his AKC AX and AXJ titles, his NADAC Elite Standard, Elite Jumpers, and Novice Gamblers titles, and his USDAA Agility Dog (AD) title. 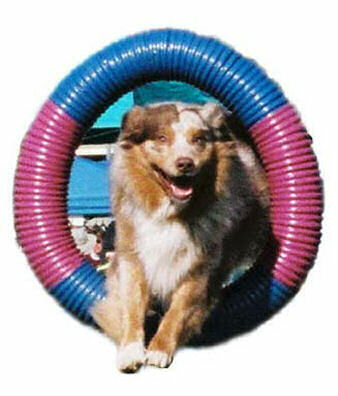 We're hoping to return to agility later but his back problem may "limit" him to obedience in the future. Currently his companion, Pilot, another Aussie just over a year old, is in training with Sandy....only time will tell! Tribble is VERY jealous!